Rhodes – A ton of trash was removed in a few hours during the beach & underwater cleanup, at the beach of Psaropoula in Rhodes. 400 students from Lyceums and Gymnasiums of Rhodes joined forces for cleaner seas and shores during the environmental action of All For Blue in association with the South Aegean Region, “Keep Aegean Blue”, which aims to preserve the blue that surrounds the islands through the education of the new generation. 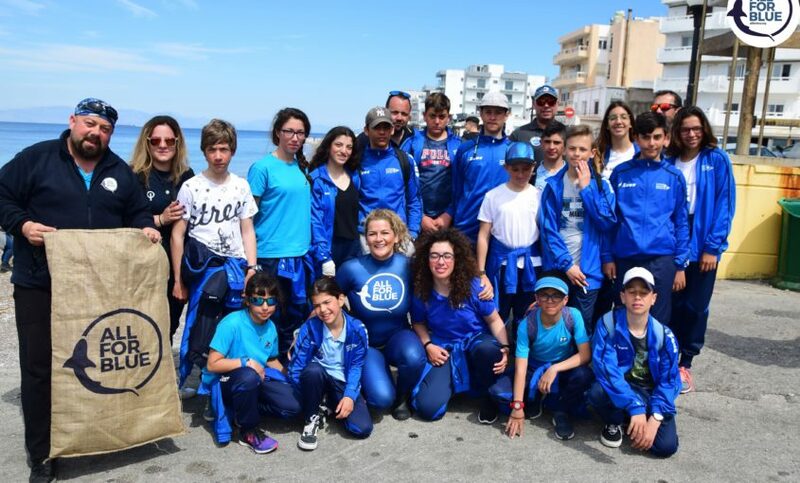 This environmental action is the largest mission that has ever been done in Greece, addressed to school pupils and about the ocean conservation. The action started with the environmental seminar that took place in the Rodini Park Hall, with the participation of students from the 2nd GEL of Rhodes, 3rd GLS of Rhodes, 4th GEL of Rhodes, 4th Gymnasium of Rhodes, Rhodes High School of Education, Special School of Rhodes and attended a total of 400 pupils . With them the South Aegean Regional Governor Giorgos Hatzimarkos, the Deputy Chief of Environment, Yiannis Flevaris and the athletes from the Nautical Club of Syros. The speaker at the seminar was Katerina Topouzoglou who briefed the participants on the purpose and action of the “All for Blue” organization. Sunbeds, mattresses, tubes, umbrellas, kites, ropes, tires, plastics, irons, were among the objects gathered within a few hours from the beach and the water. The program of actions of this initiative continues with the following stations: Symi, Tilos, Karpathos, followed by the islands of Cyclades, Santorini, Milos, Naxos, Syros, Andros, Tinos and Mykonos.